Consuming content related to a passion or topic of interest often leads women to take action in relation to the topic, especially when it relates to cultural events. As part of the POPSUGAR Insights Content, Commerce, and Culture study, we surveyed over 1,500 women between the ages of 18-44 and asked them to share the actions they've taken as a result of following a cultural event via social media or digital content. 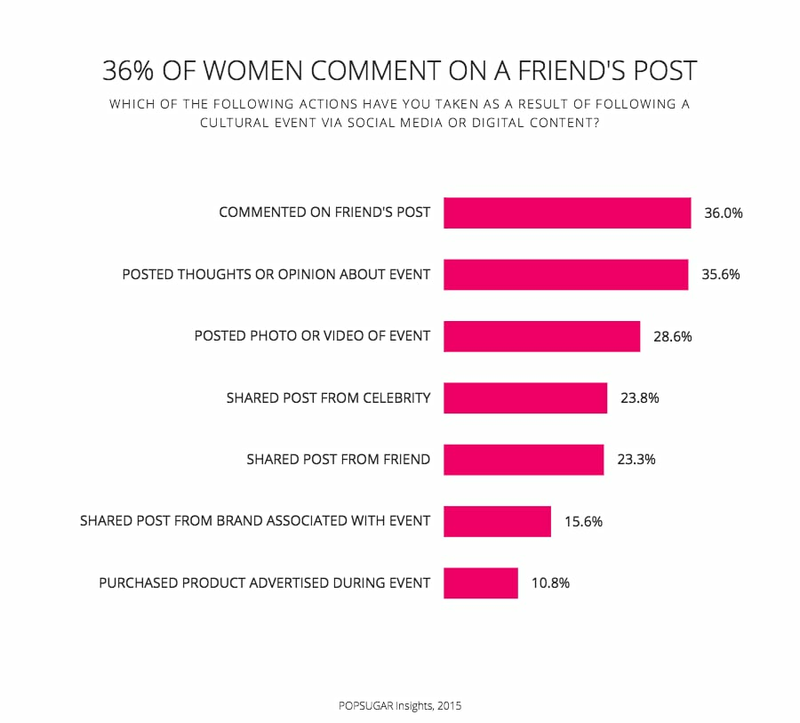 While following an event via social media or digital content, 36% of women have been prompted to comment on a friend's social media post related to the event, and 35.6% have posted their own personal thoughts and opinions about the event. Sharing photos and videos are also important ways to communicate an emotional connection to a topic, and 28.6% of women have shared a photo or video of the event to social media. According to our findings, the tweets and posts of celebrities and friends find equal footing, with 23.8% of women saying they have shared, retweeted, or saved a post from a celebrity associated with the event and 23.3% sharing, retweeting, or saving a post from a friend who posted about the event. Finally, content related to a cultural event can drive women to purchase. Nearly 11% of women say that they've purchased a product that they saw advertised within or adjacent to cultural event content.